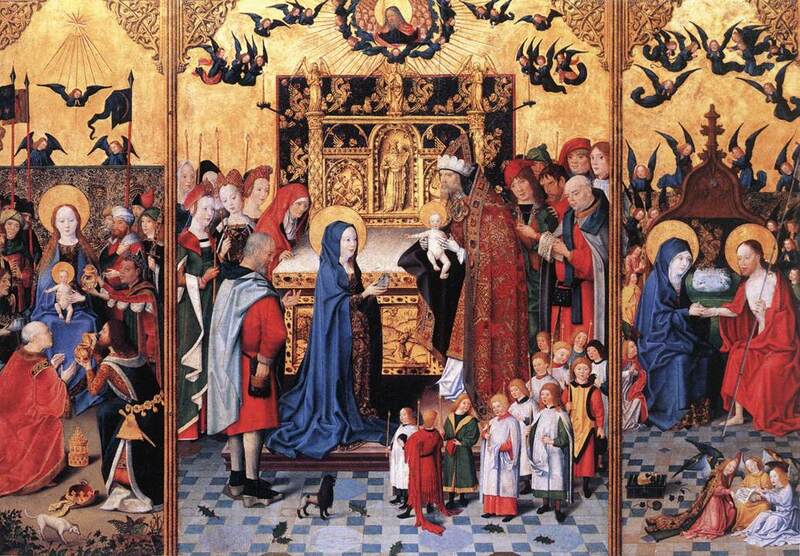 For a fairly brief period, today was kept by the Franciscans as the feast of the Seven Joys of the Virgin Mary. 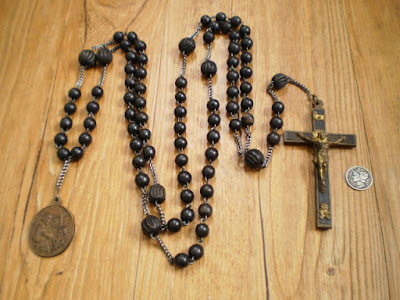 As an expression of the Seraphic Order’s devotional life, it corresponds to the feast of the Holy Rosary, which began among the Dominicans, and the observance on September 15th of the Seven Sorrows of the Virgin, which was originally the Patronal feast of the Servites. The principal contribution of the Franciscans to the Church’s cycle of Marian feasts is, of course, the Immaculate Conception, whereas the liturgical celebration of the Seven Joys is very late, and short-lived. It was granted to them in 1906, and at first fixed to the Sunday after the Octave of the Assumption; when the reform of St Pius X abolished the practice of fixing feasts to Sundays, it was permanently assigned to August 27th. In the Calendar reform promulgated in 1961, which aimed at reducing the number of feasts, and especially the so-called “feasts of devotion” (as opposed to those of Our Lord and the Saints), it was suppressed. The Altarpiece of the Seven Joys, by the anonymous painter known as the Master of the Holy Family, ca. 1480; now in the Louvre. The devotion to the Seven Joys in and of itself, however, is much older; the story of its origin is told thus in the Manual for Franciscan Tertiaries. About the year 1420, a young man, deeply devoted to Our Lady, took the habit of St Francis. Before joining the Order, he had, among other practices, been accustomed daily to make a chaplet of flowers, and with it to crown a statue of the Blessed Virgin. Having in his novitiate no longer an opportunity of making this crown for his Most Beloved Queen, he, in his simplicity, thought that she would withdraw her affection from him; this temptation of the devil disturbed his vocation, and he resolved to abandon the cloister. The merciful mother appeared to him, and gently rebuking him, strengthened him in his vocation by telling him to offer her instead of the chaplet of flowers, a crown much more pleasing to her, composed of seventy-two Ave Marias and a Pater after each decade of Ave Marias, and to meditate at each decade upon the seven joys she had experienced during the seventy-two years of her exile upon the earth. The novice immediately commenced reciting the new crown or rosary, and derived therefrom many spiritual and temporal graces. This pious practice spread quickly through the whole Order, and even throughout the world… St Bernardin of Siena used to say that it was by the Crown of the Seven Joys that he had obtained all the graces which Heaven has heaped upon him. A traditional Franciscan Rosary of the Seven Joys, still worn as part of the Order’s habit. The Seven Joys listed in the Manual are the Annunciation, the Visitation, the Birth of Christ, the Adoration of the Magi, the Finding of the Christ Child in the Temple, the Resurrection and the Assumption, but other version of the list may be found. Two more Aves are added to make the number seventy-two mentioned above, and another Pater and Ave for the intentions of the Pope. The recitation concludes with a versicle and response, and with the Collect of the Immaculate Conception. Let us pray. O God, Who by the Immaculate Conception of the Virgin, prepared a worthy dwelling place for thy Son; we beseech thee, that, as by the foreseen death of Thy same Son, Thou preserved Her from every stain, so Thou may grant us also, through Her intercession, to come to thee with pure hearts. Through the same Christ our Lord. R. Amen. V. In Conceptione tua, Virgo, immaculata fuisti. R. Ora pro nobis Patrem, cujus Filium peperisti. Oremus. Deus, qui per immaculátam Vírginis Conceptiónem dignum Filio tuo habitáculum praeparasti: quaesumus; ut qui ex morte ejusdem Filii tui praevisa, eam ab omni labe praeservasti, nos quoque mundos ejus intercessióne ad te perveníre concedas. Per eundem Christum, Dominum nostrum. R. Amen.